The 2017 GMC Sierra Denali 2500 HD is like an old friend that’s picked up a weight lifting hobby since you’ve seen them last. Largely looks the same, but there’s a mild hint of added fitness to their stature. In the case of the 2017 Sierra Denali HD, the major tell is its fully functioning hood scoop. That hood scoop leads to a new 6.6L L5P Duramax diesel engine. Don’t let the familiar displacement fool anybody. The L5P is all-new, even the block. With it comes a segment leading 445 horsepower, and a second-place stat of 910 lb-ft of torque. It’s also marginally quieter, is B20 bio-diesel capable, and burns 35 percent cleaner than before. Yes, there’s still a DEF tank bumping out just below the frame rails. There’s no getting around that. But now it’s steel plated. And that’s good news for the types who were looking to know if they could off-road this truck, should the occasion rise. On a cold morning, at the base of the Telluride Ski Resort in the mountains of Colorado, I jumped into a 2017 Sierra Denali HD strapped with a 5,000-lb trailer. At around 25-feet long, it was more unwieldy than heavy, as my trailering skills were quickly put to the test by squeezing this 7-foot-wide, who-knows-how-entirely-long behemoth around parked maintenance vans and Jeeps driven by rich people trying to get a couple of ski runs in before the slope gets too crowded. Then came the roundabout. Then came the narrow lanes. Then came the narrow, hairpin lanes up the edge of a mountain with no guardrails. All of this would have been a lot more nerve-wracking, but the 2017 Sierra 2500 Denali HD I was piloting featured a dealer-installed, camera-based trailer monitoring system that supplements the tow mirrors. The added visual aides allowed me to see at a wider angle than what the mirrors provided, via a triple-split-screen head unit display. Being that we were, at several points, 10,000+ feet above sea level, it’s hard to gauge just how much more powerful the new 6.6L L5P Duramax feels over the outgoing LML Duramax – which we’ve driven beneath the clouds. That said, the L5P still seemed to behave much the same way as the LML. Almost silent when maintaining highway speeds, a steady power band, and the six-speed Allison remains the best automatic transmission offered in any GM vehicle, period. Hopefully, we’ll soon be able to wheel the 2017 Sierra HD and the L5P at sea level here in Detroit, where there’s more air for the engine to use. A lot of you out there were curious as to what would happen if snow, or mud, or substantial debris found itself in the duct work of the new, patent-pending air intake. But with just a morning behind the wheel of the 2017 GMC Sierra Denali HD, it’s difficult for us to say what it would be like to live with the intake design that’s new with the L5P. With that said, GMC did provide us with some insight that was observed during the truck’s development. 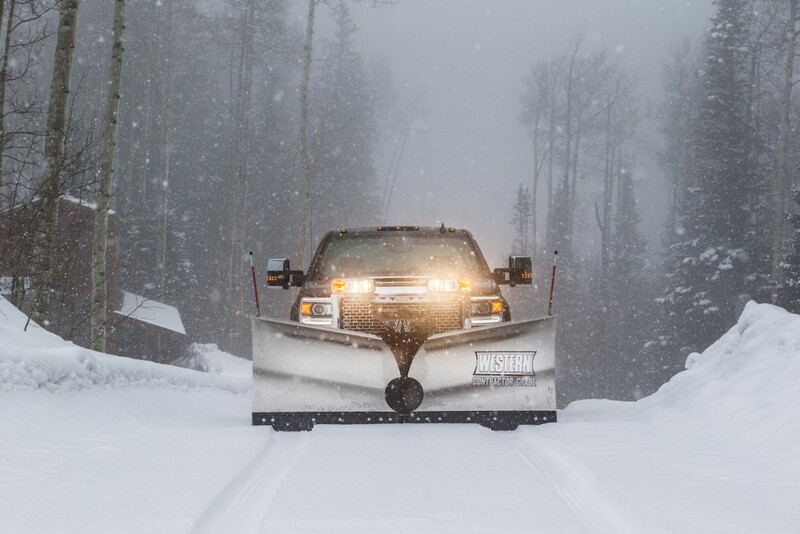 In the case of heavy snow covering the hood intake, the engine can be started and driven using air from the fender, which is the secondary intake path. Of course, to get full power, the hood needs to have collected snow cleared, which should always be done for safety reasons anyhow. Dunno about your state, but Michigan has mandated it to brush the car off with all the snow we haven’t had this winter season. If it’s cold, powdery snow, it will pass through the duct and collect on the filter. When the engine heats up, this melts snow in the air box and the duct and it will drain away as water. GMC also assures that engineers have yet to see any mud able to get any into the duct – it gets stopped at the intake grille. And if it’s just dust, it simply gets pulled into the filter, like any other induction system. Additionally, GMC says that after it concluded dust testing at both the Milford and Yuma Proving Grounds, there was dust collection in the intake’s duct work. Lastly, if somehow that dust became moistened under humid or wet conditions, the duct can be inspected and cleaned using the access door at the water drain. Along with testing at lower altitudes for the sake of engine power, we’d also look to do our best at getting this truck as dirty as possible to see how the new intake holds up. As for why GM didn’t bump up the tow ratings on the 2017 HD trucks… it’s not just the engine that plays a factor. Engineers also evaluate suspension, braking, threshold of the frame, and other factors. So, while the L5P probably could tow more than the 23,300-lb limit just fine, the rest of the truck probably will begin to have some problems. Then again, GM trucks have proven themselves to be superior real-world performers time and again, based on multiple independent tests. Admittedly, the age of the Sierra Denali HD is beginning to show a bit, especially on the inside. The cabin of the Sierra Denali HD seems to be unchanged. Which isn’t a bad thing, style-wise. But for a truck that’s north of $70,000, and a reputation of quality, buyers shouldn’t be left with fake wood, or a neglected second row that receives little to no creature comforts. 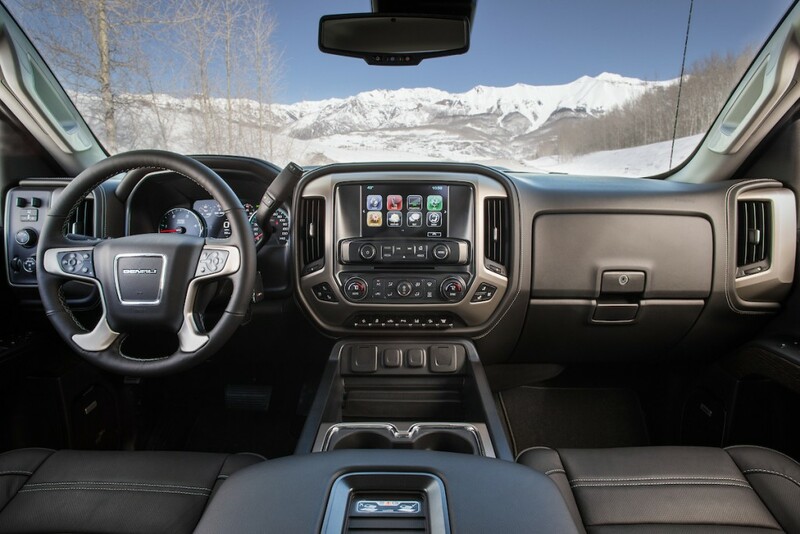 Ford offers a heated second row in its new Super Duty, for example. In short, GM missed an opportunity to improve the interior for its demographic. Perhaps even a greater opportunity by not offering a “Denali Ultimate” variant, because the truck would sell itself. Not having a complete makeover isn’t entirely a bad thing, however. One of the major qualities of the Sierra HD remains unchanged for the 2017 model year, and that’s the road manners. Compared to its rivals from Ford and Dodge, the 2017 GMC Sierra Denali HD rides better, thanks to an independent front suspension, opposed to a live front axle. This configuration irons out the road bumps more effectively than, say, the Ram Heavy Duty with its coccyx-crushing front and rear axles. All GM HD trucks also maintain a hydraulic steering rack, opposed to Ford’s electronic variable assist setup. So while the others feel like riding an elephant overdosing on Novocaine, the Sierra Denali HD comes off as more telepathic. Engine braking also produces minimal sound, compared to Ram’s J-brake style audio. Conversely from the Ford and Ram trucks, the GM HD trucks skew on the more pedestrian end of the spectrum, rather than big-rig mimicry. This includes not making the exhaust brake sound like a pneumatic jackhammer, not having a fixed front axle, or not being rated to tow 30,000 lbs. 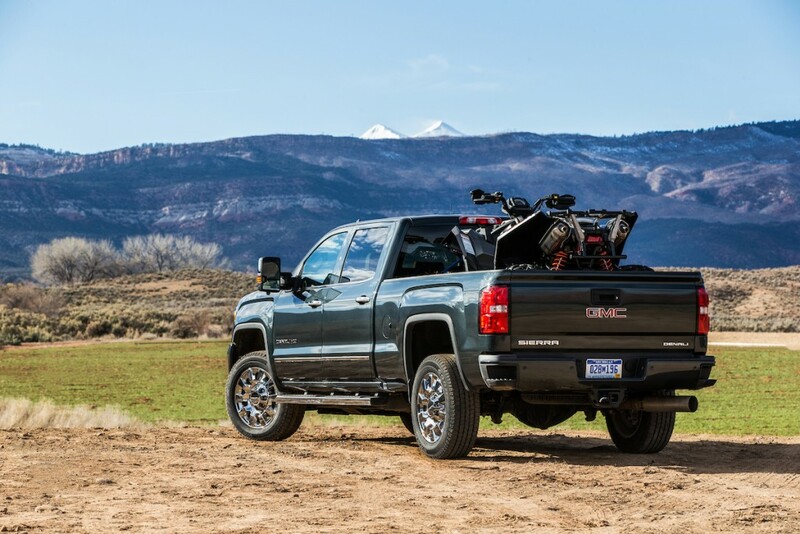 With that in mind, it’s important to note that these GMC trucks are largely bought for personal use, largely with the Duramax, and largely in Denali trim. And these little traits of convenience compound into big comfort dividends for long haul driving. These are big toys, meant for towing and hauling even more toys. In short, the qualities and USPs of why one should choose the Sierra HD Denali over similarly priced trucks remain. There’s just more power now. 2020 GMC Sierra HD: Hot Or Not? Being north of $75,000. for a fully loaded GMC 2500HD Denali, please don’t wait any longer and install the new keyless ignition system into this next generation of trucks for 2018. If you do this for 2018, also keep in mind that a full moonroof would live well in the crew cab. By doing all this you would now compete with the interior of the Range Rover which is the British elite vehicle of the UK. GMC is now entering into elite personal trucks. GMC ic the premier line of the GM manufacturer. Do it this coming year or risk more GM buyers taking a different direction to the other competitors. You better do something more than power and torque which has been needed, because all these competitors including the Japanese are pounding down your back for a big chunk of the GM Market. Good luck, I’ve been patient and will wait until 18, after that goodby. I will go and get what I want, when buying a personal truck at these prices. During the past twenty years, I have owned several personal GMC Trucks and four Cadillac Allante’s. Thank you, for the consideration and I look forward to remaining a veteran GM buyer. Do what the buyers are asking for! Step up your game GM! Seriously. Joe, you hit the nail on the head! I’ve been looking and waiting since 2015. Looked at Dodge & Ford. Been a GM man all my life(61). If they don’t produce big and new changes in their 2018 Chevy & GMC 1500 or 2500HD. I’m buying a new and different brand, with no “VIBRATION”!!! Keyless ignition system on a GM product, hmmm, how long you figure that piece of electronic equipment would work reliably? Garbage Motors is still a few bailouts away from making decent vehicles.